I thought these buildings had been there for 100 years. Although I understand there have been some nice members of Ward family in Durham over the years, some from the current generation, including Frank Ward, the realtor, have affiliations with a significant amount of unmaintained and abused rental property in Durham. Some are managed by Rick Soles, slumlord extraordinaire. It's a shame that some in a family who purport to be part of what built Durham, simultaneously undermine the stability of many neighborhoods in it. House Architect Charles Barton Keen. Can any one confirm this? Although his name was Horace Snow, I believe, I somewhat doubt that he was the Snow involved in either of those endeavors; there is a Snow house in Hope Valley built by a Brewster Snow. I don't know the original owner of the Snow Building, but just circumstantially, HN Snow appears to have been in his 60s in the photograph from the cornerstone of Somerset Villa, built in the 1890s. So not impossible, but somewhat improbable that we was doing these deals ~35 years later. I haven't ever tracked down who the Snow involved in the Snow building was, though, so I'm open to other evidence. The Snow Building was built by Horace "Brewster" Snow, as was the Hope Valley house... thats our understanding. He was advanced in age by the time he built in Hope Valley and did not live in the house very long according to our records out here in HV. But I doubt he would have been still active in his 90's...maybe a father or brother? I'd love for someone to confirm or deny this connection. I'll investigate further and post what I can find. I did determine that Horace North Snow, the HN Snow in this post, lived from 1843-1924. He served as a telegraph operator in the Civil War, worked for WT Blackwell (and represented Blackwell's Durham Tobacco Co. at the 1884 World's Fair/Cotton Centennial in New Orleans.) He left BDTC in 1900 and bought an interest in the SE Anderson Book Store, located in the 100 block of West Main St., which later burned. He worked for (owned?) the Southern Feed and Grocery business, which he left after 4-5 years. I have little or nothing about HM 'Brewster' Snow in my at-home sources. A quick look at what I can access for free in online census records makes it appear that there was an HM Snow and HN Snow born mid century, and an HM Snow and HN Snow, Jr. born in the late 1800s. Horace Snow and Brewster Snow are two separate people. Horace N. was the original owner of the Snow house in Hope Valley. His wife's name was Sue, and they had a son, Brewster. Horace N. was born in 1885, and died in 1959. He was listed in the 1926 city directory as a bookkeeper with L&M Tobacco Company. Ditto in 1927, 28; but in the 1930 directory he is listed as Manager, Snow Building. The Durham Architectural Inventory erroneously lists Brewster Snow as the original owner of Snow house, and this error has been picked up by others since then. That is a strange progression of occupations. Maybe Mrs. Snow was from a moneyed family, and they built it for him? This information comes from those researching Hope Valley for the National Register. I would guess that the Horace N. you refer to was Horace N. Snow, Jr., as he is listed in the census - given the birth and death dates of the Horace N. (Sr.) I listed above. There is a HM Snow that was contemporaneous with HN Sr., as well as a different HM Snow that was contemporaneous with HN Jr.
Miss Katie Lindsey, one of the owners, died on 10 Aug 1969. She taught first grade at E. K. Powe in West Durham, retiring in 1957. Horace North Snow was married to Anna Exum, then Anna Exum Snow. They had four children, Horace North Snow, Jr. in 1885, Richard Wright Snow in 1890, Beverly Carradine Snow in 1895 and Mary Exum Snow in 1896. Anna E. Snow was the first woman on the board of trstees at Trinity College, now Duke. She came from one of NCs oldest families, the Exums. When she and Horace were married her family gave them a large amount of land as a wedding present. That land is now down town Durham. Anna built an office building on part of the land called the Snow Building. Anna E. Snow is my great great grandmother. Thanks for the info on HN Snow and Anna Exum. I actually live on Exum St near downtown, and I was never sure who the street was named after. I do know that, according to the deed book, our land originally belonged to HN Snow (with the rest of the neighborhood). I'm just wondering if anyone knows which specific Exum my street was named after. The 900 block of Exum St did not exist on the 1913 Sanborn map, and the 800 block was called "Harward Ave". Most of the old houses on the 900 block were built right around 1920, if that helps. James W. Blackwell, brother of WT Blackwell (of Blackwell's Durham Tobacco fame) built his house at the southwest corner of Lee (later Duke) Street and Yancey Street sometime between 1881 and 1887. 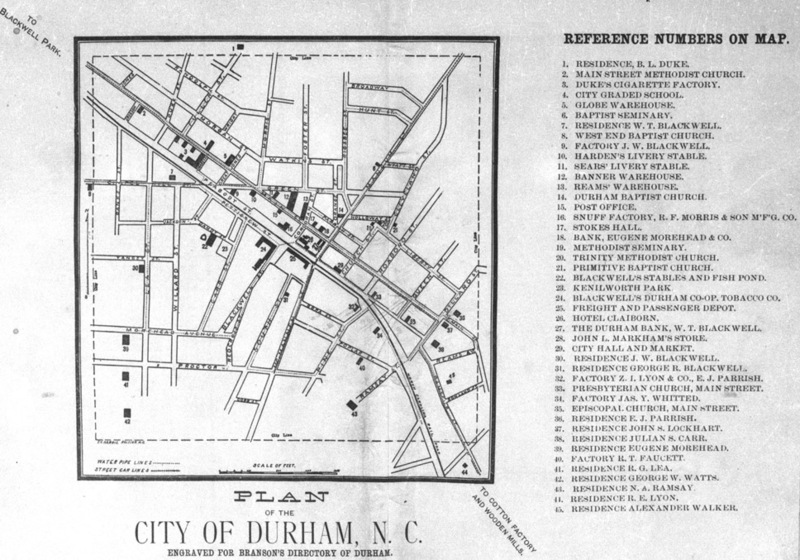 The house first appears in the City Diretory of 1887, which included a map of prominent Durham locations. 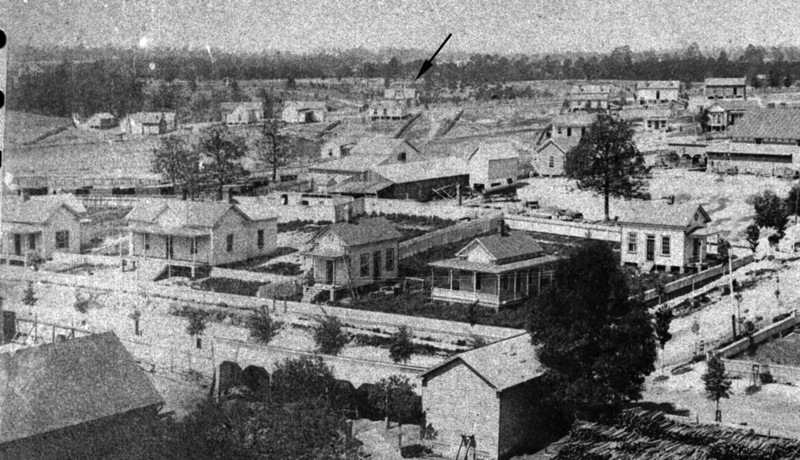 Looking southwest, 1880s. I've noted the house with an arrow. The house, with unusual trapezoidal gables and cruciform layout, is visible on the 1891 Bird's Eye of Durham, above. The house was the site of the genesis of the Second Baptist Church (later Temple Baptist Church) which began as a bible study here before William Vickers gave the land to establish the sanctuary on West Chapel Hill St.
Blackwell had a number of careers, including work with the tobacco company, head of the Builder's Manufacturer's Supply Co., and a cashier for the Durham Water Company. He also bought and sold real estate, and later lived at 701 Jackson St. after selling this house in the 1890s. Wyatt Dixon tells the story that the house was commissioned by Blackwell, who immediately afterward, went on his honeymoon for several weeks. When he returned, he noted furniture being hauled up to the second floor through an upstairs window. "Why don't you take it up the stairs?" said Blackwell. "There are no stairs," replied the workmen. Evidently, when Blackwell had drawn his plans for the house, he had forgotten a stair. The workmen retrofit a circular stair at the end of the center hall. In 1901, the house was owned for a time by HN Snow, who subdivided the large lot that the house was on, building 505 Yancey, 507 Yancey, and 604 S. Duke on the original lot. The house was bought by Ms. Katie Lindsey in 1906, and she lived in the house for the next 60+ years. 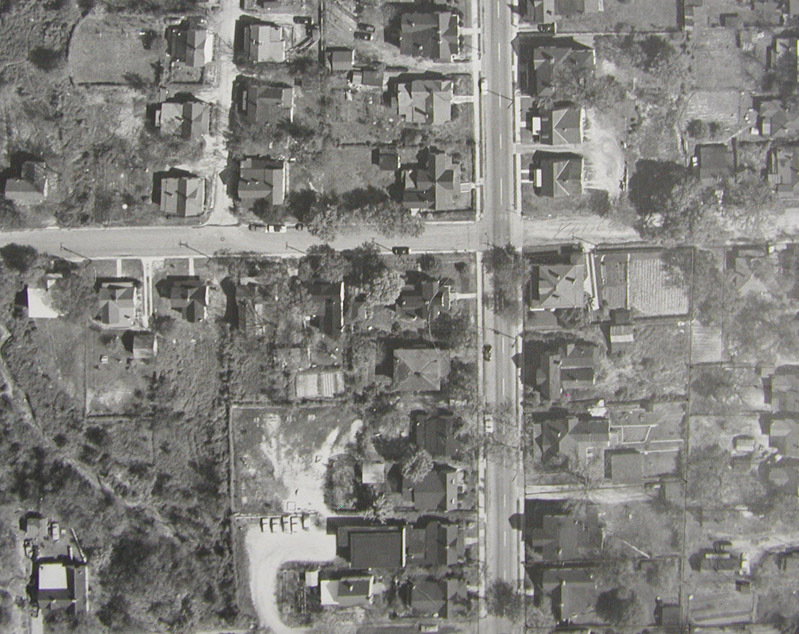 1959 aerial shows the intersection of S. Duke and Yancey, with 602 S. Duke on the southwest corner. The original size of the lot can be seen from the lots immediately to the south. 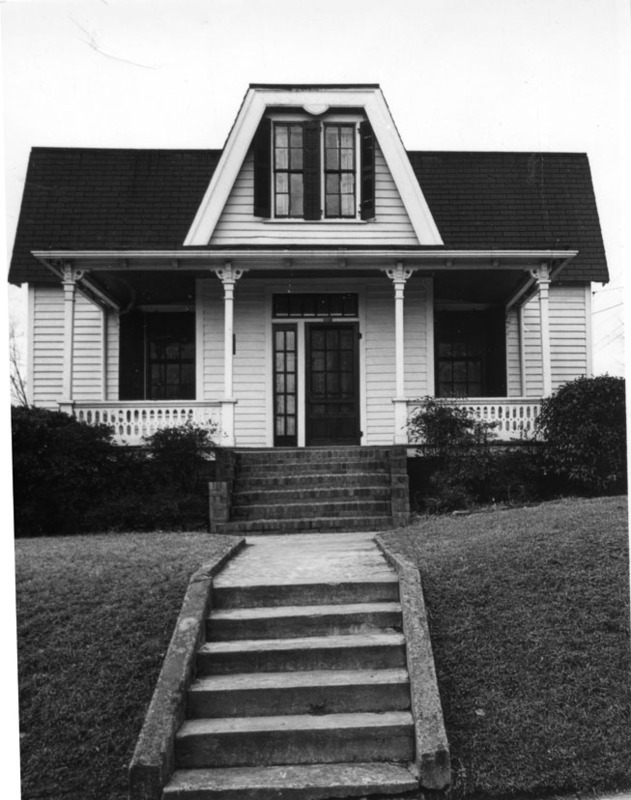 The front of the house, 1965. Most of the 600 block of South Duke was irretrievably altered by the freeway passing just to the south of this house in 1967. Looking north on South Duke St. from near Morehead, 07.05.67. 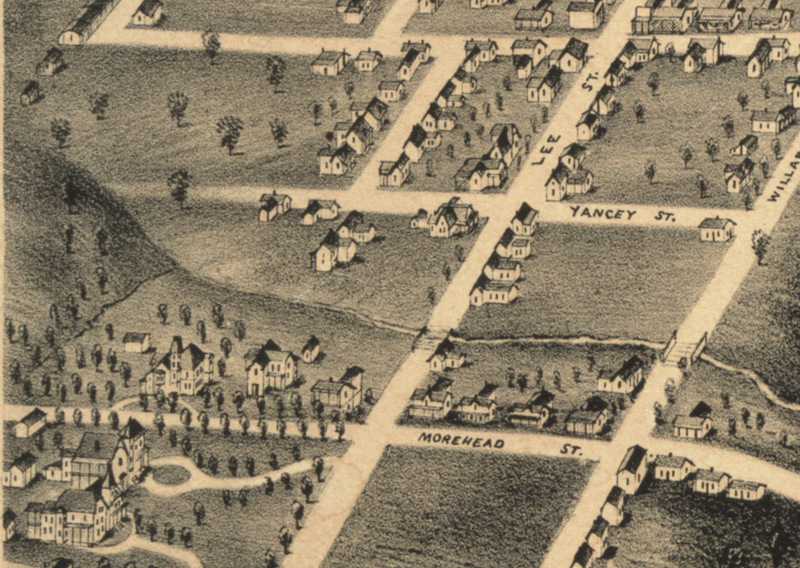 The original topography of Duke St. can be seen in this picture, including its intersection with Parker St. at the bottom of the 'valley.' 604 and 602 S. Duke are on the other side of the construction, on the left side. A color shot, similar timeframe, from the NC Mutual building, showing the intersection of Yancey and South Duke in the foreground; the trapezoidal gables of 602 S. Duke are visible at the intersection. November 1967 - the view from near Blackwell and Morehead, looking northwest - the red is the structure of the overpass being built over Blackwell St. The view south on S. Duke, 11.21.67. The Duke St. overpass is in. The houses at 602 and 604 South Duke, which previously sat above the grade of the road, are now lower, with 602 at grade and 604 below the grade of the road. Ms. Lindsey evidently died around 1970. The house was bought, along with 604 S. Duke and torn down for an office for Frank Ward Realty. This office was later home to Baseball America, after Frank Ward built his newer suburban-style office complex across Yancey St. in the 1990s. Since ~2000 it has been a law office for lawyer Lisa Lanier.